Pattern Description: Alternating vertical panels of small diamonds and horizontal prisms cover the exterior. 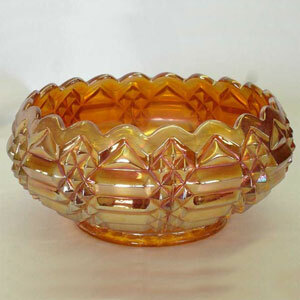 This rose bowl and a reported perfume bottle are the only known pieces in this pattern and marigold is the only known color. Jacob's Ladder rose bowl is 3” high with a top opening of 5 3/8”. The collar base is 3 3/8” in diameter with a 24 point star pressed into the underside of the base. 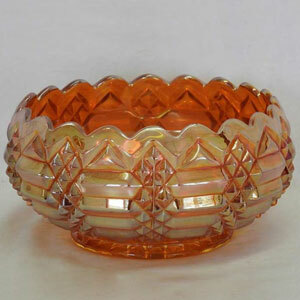 This pattern was produced in Early American Pressed Glass by Bryce, Walker & Co. until 1882 in clear glass in a multitude of shapes and was called Maltese.